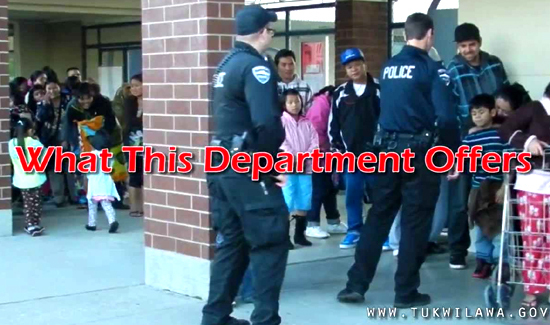 In Washington State, the Tukwila Police Department is working hard to let immigrants know that they can still call 911 without being deported. An immigrant called 911 and reported someone sneaking around his residence. Within an hour, police officers had brought the man to an ICE facility. “It’s sad. It’s sad. It’s just unfortunate that he thought he was doing the right thing, and at the end of the day he was detained for that,” said Angela Canady, who lives in the same block. The police say the whole thing’s a big mix up and that they’re not rounding up immigrants and dropping them off for the feds. Officials say that sent a warrant from ICE came down in a format its officers had never seen before. Residents were outraged and the agency has been spending a lot of time on damage control. 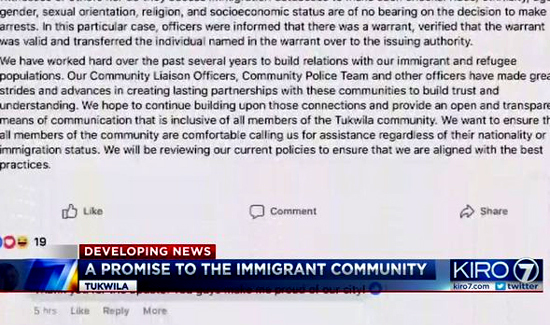 “We will not be responding to these types of warrants from U.S. Immigration and customs enforcement moving forward,” read a message posted by the department on Facebook. 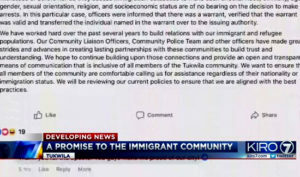 Above: a screen shot of the agency’s Facebook posting. And here’s the rub- a lot of people love this stuff. For some immigration enforcement is much higher priority than catching drug dealers, serial rapists and murderers. But some might wonder if we really need so many police officers in the US if they’re defacto ICE agents that respond to service calls by calling federal law enforcement agencies. “It is vital that every member of our community feel safe and comfortable calling the police for help. This is why we became police officers in the first place,” the Facebook message from the agency went on to say. The agency says it’s also taking measure to ensure this never happens again.